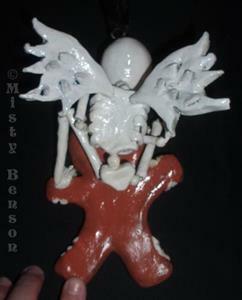 Run Run Fast As You Can - ORIGINAL Skelly Sculpture Ornament 6.5"x3.5"x3.5"
It's a sweetly spooky Sunday around here! I have one of the creepiest but cutest ornaments for your tree! Whether it's for your Halloween tree or your Christmas tree, this fella is full of mischief! He's pretty good sized for an ornament, too! He's as big as my hand, and he's about the dimensions of a coffee mug (much lighter though!) 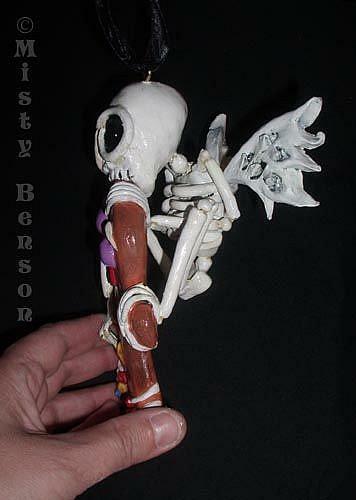 I recently dropped off this darling little Skelly for the Basement Gallery's Benefit Auction! This guy was so much fun to create! He is being auctioned off with all proceeds going to Life's Kitchen -- an organization dedicated to transforming the lives of at-risk young adults by building self-sufficiency and independence through comprehensive food service and life skills training, and placement in the food service industry. This sculpture was dreamily sculpted and magically painted as a one of a kind piece for your tree -- all done by me! You may see the original painting that inspired this sculpture here: http://www.mistybenson.com/RunRunFastAsYouCan.html I have never sculpted an ornament before! It took me a week to create this little guy, so no matter the final price, you'll be getting an original sculpture and your money's worth! Don't miss your chance to get this piece of dark humor! Materials: Mixed Media (Acrylic Paint and Paperclay) He is about 6.5" tall by 3.5" by 3.5". About the Skelly: Run, run fast as you can! You can't catch me! I'm the Gingerbread Man! 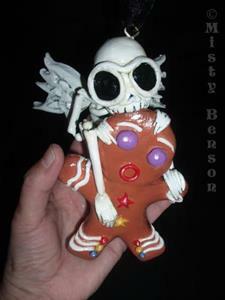 These were the famous last words of the Gingerbread Man right before this little skelly caught him! This morbidly adorable fella loves his sugar! 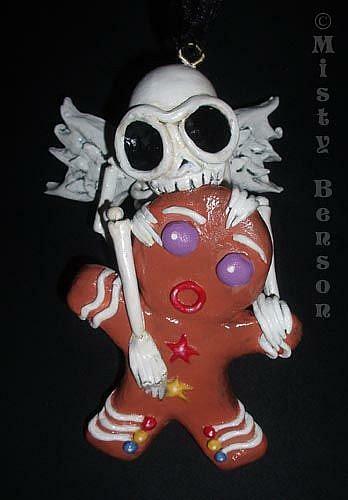 I cannot tell you how this will end, but if Gingy had fingers, he'd be crossing them! Enjoy this fractured fairy tale! To bid on this ornament, you can telephone the Gallery at tel: 208 333 0309 or email your bid to auction@basementgalleryboise,com. Your email must include your name, lot number, bid and telephone number. Lot Number (or use my artist name): The Gingy Skelly is Lot #4! Online bidding closes at 5 p.m. Saturday, December 10th. So please make sure to send in your absolute best bids so you won't miss out on this sweet treasure! Yes, they do ship! So you can still take it home even if you cannot pick it up in person! Feel free to ask them about shipping! All proceeds from the auction benefit Life's Kitchen (http://www.lifeskitchen.org/). You may also go down to the gallery and bid in person! I hope you enjoy this bony treasure! This ravenous skelly has a sweet tooth unmatched by any other! Will you be able to save Gingy? !